Dia de los Muertos (Day of the Dead) is a holiday celebrated throughout Mexico and also around the world in other cultures. On Bainbridge Island it will be commemorated at the Museum of Art for 5 days beginning November 1st. The holiday focuses on gatherings of family and friends to remember and honor the dear ones who have died (including pets), and to help support their spiritual journey. Good food is always involved! This will be the third year that Bainbridge Island Museum of Art (BIMA) has helped our community celebrate this occasion. In this podcast, BIMA Education Director Kristin Tollefson describes how this year’s celebration will take place over five days, beginning on Tuesday, November 1st when the ofrenda (altar of offerings) will be formally opened to the public in a quiet ceremony from 3:30-5:30 pm. Then on Saturday, November 5th, there will be a fun celebration with music, public presentations about the ofrenda, face painting, crepe paper flower making and other activities for children and families. Also on that Saturday, there will be a special lunch offered at the Bistro, with Mexican hot chocolate and pane de muerto. 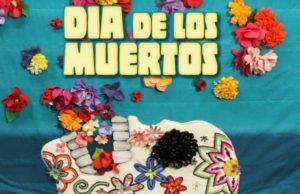 For more information, please see the Day of the Dead event page on the Museum’s website. Credits: BCB host Channie Peters; BCB audio editor: Chris Walker; BCB social media publisher: Barry Peters.